You upgrade your QNAP from Backup Station to Hybrid Backup Sync. Upon launching Hybrid backup sync all of the scheduled jobs are missing. 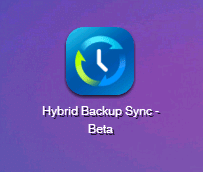 You also notice that in the notifications it says that the QNAP Hybrid Backup Sync says that it is still installing and has been for quite some time. If you have left the QNAP for long enough try restarting it. All the scheduled jobs should reappear again. It appears that the QNAP Hybrid Backup Sync may get stuck at completing the installation even though it has been fully installed.